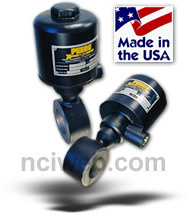 Reliable ... PEECO flow actuated switches are simple mechanical devices. Movement and friction are quite minute, giving longer life with accurate repetition. Positive ... Properly designed, there is nothing to interfere with the action. A change in flow conditions mandates the proper response from the PEECO Flow Actuated Electrical Switch. Capable ... Designed for your application with minimal pressure drop, the PEECO Flow Actuated Electrical Switch is completely field adjustable, available in any electrical rating desired, any type of connection, most metals, Teflon® and plastics. Explosion proof and non-explosion proof. Functional ... Based upon the principle of direct actuation by the flow of pipe or duct media such as liquids, slurries, fine powders, etc. 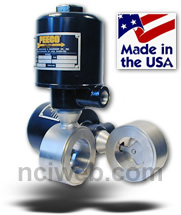 The PEECO Flow Actuated Electrical Switch will reliably indicated any change in flow conditions. Peeco Flow Actuated Electrical Switches are unique in the field of flow controls. They are not a standard shelf item, but are specifically designed to accommodate your application. Maintenance free in lines from 1/16" to 12 ft. or larger. Actuated by flow - not pressure. No need to be concerned with minimum and maximum flow ... you state your requirements, Peeco will accommodate them. From -450° F to +2000° F. From high vacuum service to 10,000 psi. Fully field adjustable over the entire range (less than 10% dead band/differential between make and break). Explosion proof models are approved by Canadian Standards Associate (CSA), City of Los Angeles, Institute National des Industries (Belgium), French Approval I.C.I.E. and the U.S. Army Corp of Engineers. Electrical by Underwriters Laboratories. The desired flow indication - increase, decrease, reverse - is transmitted mechanically from the line media by deflection of the paddle through the stem and bellows or flexure tube assembly, causing micro-switch actuation and resultant electrical contact for transmission of signal to whatever ultimate point desired. Base travel of the stem is from 1/16" (H Model) to 1/4" (E Model). Standard Micro-switch travel is approximately .005"
The flex (bellow or tube) is silver brazed or welded, per your specification, making the Peeco switch inherently leak proof, without employing packing glands or stuffing boxes. Our trained technical staff is available (at no cost to you) for consultation, design suggestions, engineering, layout problems or a general discussion of PEECO flow actuated electrical switches and their place in the dynamics of flow. Note (1): For 400° F change micro-switch. Note (2): Specify NEMA classification. Note (3): Specify distance from face of mounting flange to top ID or C/L of pipe and pipe size.